Think about it as a burrito for the western world, and the spring roll figuratively springs to mind for an equal counterpart in the eastern world. It is basically using a very thin skin and wrapping it around some ingredients, and it's practically enjoyed by all races in Malaysia depending on how you prepare them. Variations are plenty - steamed, cold, pan fried or even deep fried! But, have it ever occur to you on how the skin of the spring roll is actually made? If it wasn't for the many locals that have told me about this place, never in my mind would it have occur to me to visit Chowrasta Market to see this art in motion. Snuggled in the row of shops on the right of Chowrasta Bazaar stands Uncle Lim's shop, aptly and simply named "Poh Piah/Spring Roll Skins". Walking along those lanes invokes a sense of nostalgia as you step back in time to visit the humble yet quaint pre-war shophouse. From afar, its not that tough to spot a middle aged man holding a blob of white dough in his hand and continuously lifting it. It may seem odd for the uninitiated, on what on earth is he doing by smacking the white blob onto a pan? That, is actually artistry in its highest crimsons. No two pieces can be replicas at Uncle Lim's shop because simply every single piece is made by hand. Despite the tide of modernization in food preparation, it is indeed refreshing to see that the traditional methods are still kept in place as it definitely beats the machine-made skins hands down in every possible way. 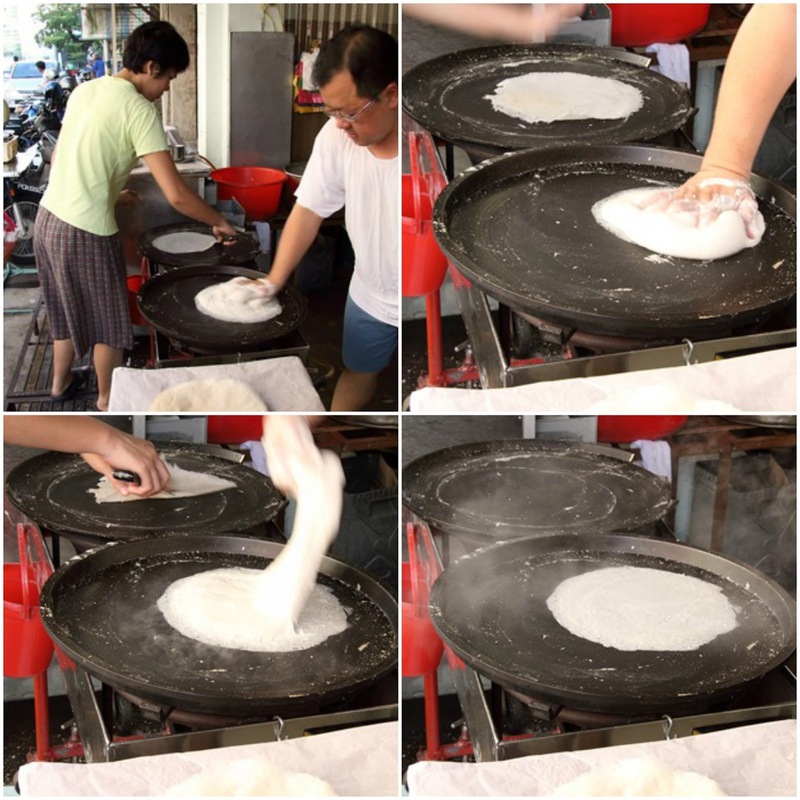 Uncle Lim holds up a large rope of dough in his right hand and deftly brings it to the hot flat pan in front of him. With just quick touches, he gives it a thorough scrub across the surface and then equally quickly yanks it off the pan. When done accurately, the thin piece of dough will cook in about 10 seconds and his helper will skillfully scrap it off the pan and place it on top of a pile. Imagine that, with the process repeated constantly skin after skin. Such autonomous motion by both Mr Lim and his helper, and one can easily stand for a moment to just admire the artistry. It may seem easy, but standing in front of hot pan and dipping your arm with such closeness is definitely challenging. Take that up a notch - Mr Lim has been patiently dishing out delicious spring roll skins for about half a century now! Taste-wise, I would say that its the best bare popiah skin that I've ever tasted. Most locals swear by it and even tourist are flocking over to his shop just to watch this culinary art in motion. The finished product, commonly fresh popiah, can never be as tasty without an even tastier skin to hold up the ingredients. Penang is indeed proud to be home of so many culinary art and heritage, and it just gives me pride to really call Uncle Lim's spring roll skins a gem in Penang. This popiah skin stall manned by Uncle Lim is located at No. 5 Jalan Chowrasta, 10100 Penang. The opening hours is from 7:00am till about noon daily. No rest day has been pre-determined. Most buses and public transport around Penang will be able to get you to the KOMTAR area and Chowrasta Market is a walk able distance away.